Significant numbers of Buddhist holidays and festivals are celebrated each year in Thailand among which the most important festival is the Visakha Bucha. The Visakha Bucha is an important event where the three significant events occurred in the life of the Lord Buddha in the Visakha month – the sixth lunar month is known as the Visakha Month in Thailand. The full moon of the Visakha month is a day when the Lord Buddha was born, achieved the holy clarification after 35 years, and the day of his death – Lord Buddha entered Nirvana 45 years after his holy enlightenment. What is the Meaning of Visakha Bucha? The first event celebrated during the full moon of Visakha month is the birth of Lord Buddha that took place almost 2500 years ago. Originally, Buddha was born as a rich prince and a nation to rule, but he decided to leave his luxury life and went away in search of holy wisdom. Buddha started living in the woodlands outside the region with solitary persons. While living in the woodlands and sitting under the Bodhi tree, at the age of 35 years, Buddha finally found the holy clarification and enlightenment. Lord Buddha passed away at the age of 80 years – 45 years after gaining the holy enlightenment. Buddha died on Tuesday in the zodiac year of a small snake during the Visakha full moon. Buddha passed away under in the Capital of Malla state under the two Sal trees. Visakha Bucha is celebrated in May every year. This year, it will be celebrated on May 29 - Tuesday. Besides other religious holidays, Visakha Bucha is considered as the most significant yet important holiday in Buddhism – celebrated as honoring day for Lord Buddha. Visakha Bucha is also listed as the “World Heritage Day” in 1999 by the UNESCO. As Thailand holds the majority of the worshippers of Buddha, it was chosen as a permanent place to celebrate this event annually. Visakha Bucha is celebrated as a public holiday in Thailand. As mentioned earlier, the three vents celebrated on this occasion are believed to have happened on the full moon of the sixth lunar month according to their calendar. Most of the times, the Thai calendar puts this holiday in May, though it also falls in June sometimes. 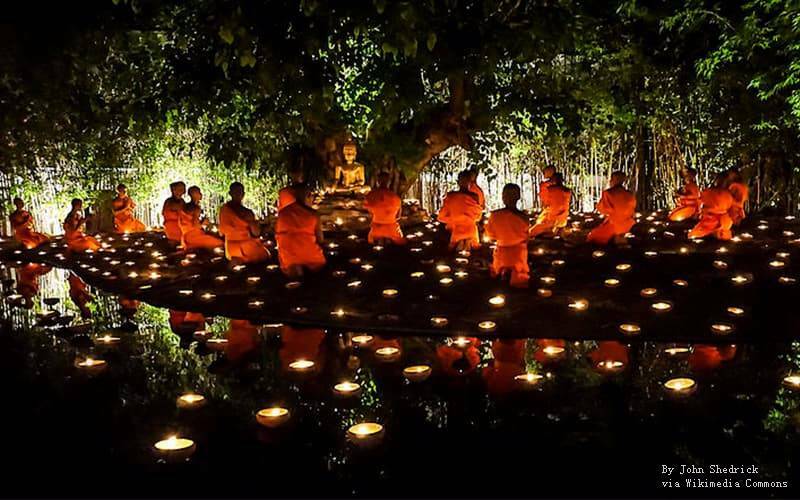 Following are the most common activities accomplished on the Visakha Bucha day. “ทำบุญ tam bun”: Making merit by giving donations to the needy, by going to the religious temples, and participating in other Buddhist activities. “ปล่อยนกปล่อยปลา bpòi nók bpòi bplaa”: Setting fishes and birds free to stay away from bad luck. Visakha Bucha comes with a lot of ancient traditions including the candle-lit practices that people perform after the sunset throughout the country. The extreme Buddhists walk around the principle chapel clockwise for three times, and each person clasps three strong sticks, lotus buds, and a lighted candle. 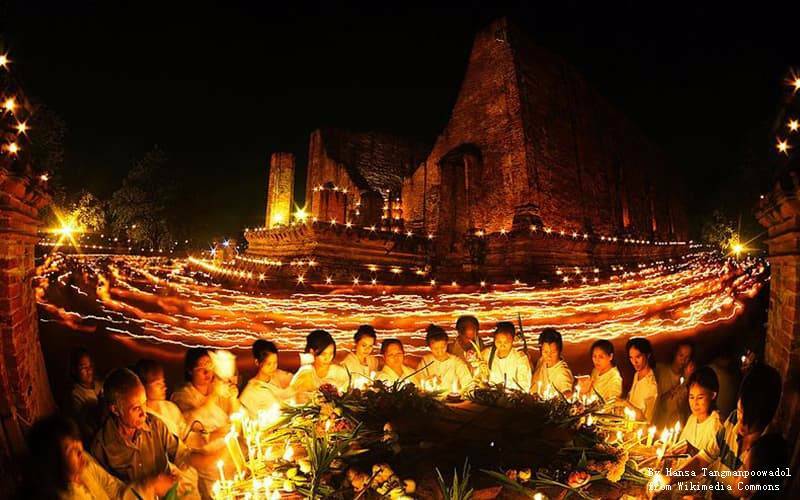 At this time, the atmosphere all over the country is filled with smoky air and burning incense that comes from the lighted candles – the sacred celebrations of Visakha Bucha day by Buddhists end this way. The festival period is the best time of the year to interact with Thai people, and experience the local life. As the Visakha Bucha day is celebrated as a public holiday in Thailand, it is obvious that banks, schools, government offices, and the majority of the markets remain closed. The sales of alcoholic drinks are banned throughout the country – starting from the midnight of the religious holiday following the entire next day. Though, reputed and registered hotels remain open for tourist under the hostels Act.